From the mid 1950's Australia's sugar millers were rapidly replacing their steam locomotives with diesels. By 1962 orders for over one-hundred 2 ft gauge diesel locomotives had been placed, with the market split between two of Australia's largest manufacturing companies - Clyde Engineering Co. Pty Ltd, and Commonwealth Engineering (Queensland) Pty Ltd. The family engineering business of E. M. Baldwin & Sons would have seemed a most unlikely potential competitor. Still reflecting its farming origins with large scale egg production, its small general engineering business specialised in custom designed stainless steel food preparation equipment. But in 1962 the firm was approached to build a small cane field locomotive, and a year later the firm commenced its pioneering work with flame-proofed rail vehicles. With frequent visits to potential and established customers to find what they needed, and a work environment that promoted flexibility, over time E. M. Baldwin & Sons became the most innovative and successful builder of diesel industrial railway equipment in Australia, best known for their introduction to the Australian sugar industry of the bogie cane field locomotive. 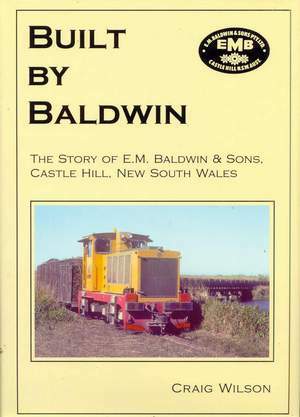 This book is not only the story of the development of Baldwin's cane field locomotives. It also describes the Company's underground, shunting, and fairground locomotives, brake wagons, and the Company's diverse range of engineering work, from stainless steel vessels to broad-acre agricultural tractors.